The Armenian opposition activists that rallied around defeated presidential candidate Raffi Hovannesian in the aftermath of the 18 February Presidential elections have been faced with a common dilemma – their protests are large, but not as yet large enough to force the government’s hand. In political events in the South Caucasus this has proved a critical factor before. In October and November 2003 protests against President Shevardnadze in Tbilisi were a nuisance rather than a threat, until the opposition put in a last-minute effort and was able to mobilise around 100,000 people. That marked the end of Shevardnadze and his government. Similarly last year many did not take Bidhzina Ivanishvili seriously as a challenger to President Saakashvili until his public gatherings stared attracting tens of thousands. Mobilising these tens of thousands is not easy in societies which are not known for their tolerance and where participating in an opposition event may seriously harm your career. In Armenia the matter is further complicated by the fact that the opposition is not united. The support of the opposition parties, including ther Dashnak ARF and the Prosperous Armenia has been at best tepid. It is clear that on his own Raffi Hovannessian does not have the critical mass of support to unseat the President government. Which is why he has been trying to reach out to the other opposition forces and why he has tried to de-personalise the protest movement and turn it from a movement of support to his candidacy into a national movement, but with only limited success. Size matters when it comes to public protests. In Armenia the size of the protests of the last weeks has not been large enough to force the government’s hand and the opposition now risks losing the momentum. 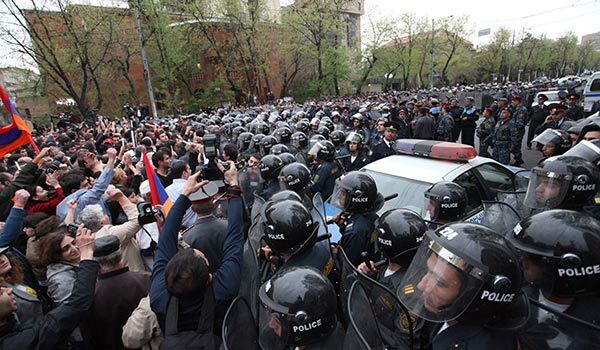 photo: Stand off between opposition actiovists and Armenian police on the day of the inauguration of the President. (picture courtesy of ArmeniaNow.com).